Show off your brand with personalized measuring cups and spoons from Promotion Pros and appeal to the inner cook in your customers. 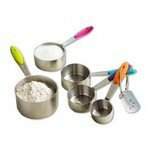 We offer a variety of measuring cup and spoon options including adjustable measuring spoons, measuring cups, swivel measuring spoons and more, so you're guaranteed to find exactly what your customers and employees need for those home recipes! Custom measuring spoons and cups are great to use as a quick thank you to customers who visit your company and can also be given to staff members during company-wide events. 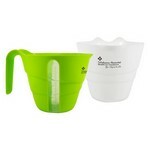 The unique 4 Cup Measuring Cup helps you to get the perfect measure of ingredients for all your favourite recipes. 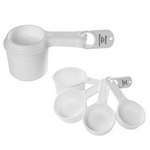 This modern measuring cup comes with the quarter cup measurements on one side and in millilitres on the other side so you could always have the accurate reading of your measures. 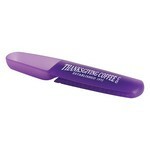 The Measure-Up Scoop'n Clip features customization ability and makes amazing Business Giveaways with your logo and message. The Colorful Measuring Cups features durable stainless steel construction, Customizable with your logo to Promote your Brand. Serve in style with this all new Nylon Spoon! This nylon spoon is heat resistant up to 428° F making it ideal to serve steaming hot food from the stove or oven. 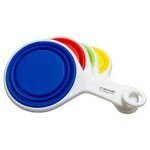 The soft handle is slip resistant and provides a comfortable grip while serving. 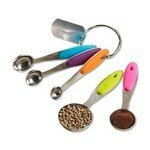 The Colorful Measuring Spoons features stainless steel construction and allows inserting custom imprint for amazing Business Giveaways. Our Pop Out Silicone Measuring Cups White/Multicolor Cups features pop open design for ease of use, customizable with your logo for Brand Recognition. Our 32 Oz. 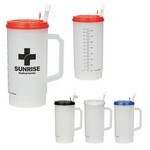 Medical Tumbler with Measurements features durable polypropylene construction and offers customization ability to create Custom Logo products. 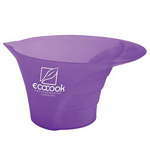 Our customizable measuring cup features a modern design and single logo imprint. 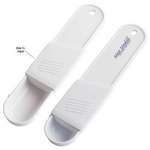 This custom measuring spoon set features a custom logo imprint and nesting design.